Two small cars, the Fiat 500 retro 3-door hatchback and a 5-door hatchback based on a next-generation Fiat Panda. The latter likely will be sold as a Chrysler or Dodge. Alfa Romeo MiTo, plus a vehicle for one of Chryslers brands. A vehicle on Fiats C-Evo platform made at a U.S. Chrysler plant, possibly a Dodge Caliber replacement. The alliance also would build the Alfa Romeo 147 replacement for U.S. sale on this platform. A replacement for the Chrysler Sebring and Dodge Avenger mid-sized sedans on a stretched version of the C-Evo platform Fiat is developing. Chrysler LLC and Fiat S.p.A. will bring seven new vehicles to North America under their alliance — four with Chrysler brands and three as Fiats or Alfa Romeos. The vehicles will be built at Chrysler plants in North America and sold through select Chrysler, Dodge and Jeep dealerships, according to sources who have seen the product-sharing agreement. The plan includes vehicles on four Fiat platforms — in the microcar, or A, through the mid-sized, or D, segments. The two companies have not decided on timing or volumes. Teams at both companies are hammering out details of a plan they hope to make final by April 30. The two companies said last week that Fiat would take a 35 percent stake in Chrysler. Under terms of their tentative agreement, Chrysler will make the Fiat 500 at Chrysler's Toluca, Mexico, plant for sale in North America, according to sources familiar with the plans. Chrysler will retool the Toluca factory, where it currently makes the Dodge Journey crossover and Chrysler PT Cruiser. Chrysler announced last week that it would quit making the PT Cruiser this summer and put the line up for sale, making room for another vehicle. Speaking with reporters at the Automotive News World Congress on Wednesday, Jan. 21, Frank Klegon, Chrysler executive vice president for product development, said teams from both companies were working on a plan. Referring to Chrysler's current lineup, Klegon said, "We don't have an A-segment vehicle, and we don't have a B-segment vehicle, and our C-segment vehicle [Dodge Caliber] is in the next stage of renewal. That creates some opportunities for us." Fiat and Chrysler begin talks on possible areas of cooperation. Fiat Powertrain Technologies buys the Brazilian engine plant Tritec from Chrysler. Fiat studies whether to buy a Chrysler plant in the United States to build Alfa Romeo cars and/or a Chrysler plant in Mexico to produce the Fiat 500 minicar. Chrysler approaches Fiat with a list of whats needed to turn Chrysler around. Fiat and Chrysler conceive a possible deal calling for Fiat to exchange technology for a stake in Chrysler. Deal would include distribution and purchasing cooperation. Fiat and Chrysler begin finalizing nonbinding agreement that would give Fiat a 35% stake. Deadline to sign final agreement. 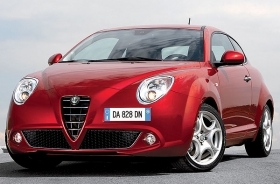 Fiats Alfa Romeo MiTo would be sold by one of Chryslers brands. The Fiat deal, if made final, would provide a quick fix for Chrysler's small-car problem. The company needs a fleet of vehicles to meet new, stricter U.S. fuel economy standards, which take effect for the 2011 model year. The agreement calls for two minicars in Europe's A segment, the Fiat 500 and one with a Chrysler or Dodge badge. A CSM Worldwide report says the 500 could be sold in the United States in 2012. The five-door minicar could be based on the next-generation Fiat Panda, a small five-door hatchback that is the biggest-selling small car in Europe, where Fiat dominates the segment. A Panda-style vehicle would give dealers a city car. The 500 is something else altogether — a small, retro three-door that has Mini-style cachet without the Mini price. 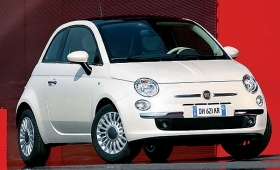 The 500 is Europe's second-best-selling minicar, trailing the Panda. "The 500 is selling like hot cakes, even in this difficult economic environment," said Nigel Griffiths, an analyst for Global Insight in London. "It has been a runaway success." Under the plan, Chrysler dealers also would get a subcompact, or B segment, Fiat, most likely derived from the next-generation Fiat Grande Punto. Dealers also will sell the Alfa Romeo MiTo, built on the same platform. The CSM Worldwide report says Chrysler could get a small crossover from this platform. The alliance also would give Chrysler access to Fiat's 1.4- and 1.8-liter four-cylinder gasoline direct-injection engines. The engines would be made at a Chrysler engine factory, most likely in turbocharged versions. Chrysler's smallest engine now is a 2.5-liter four-cylinder made at the Global Engine Manufacturing Alliance plant in Dundee, Mich. CSM says the engines could be built in Dundee. A source familiar with Fiat plans says Chrysler may make only the 1.4-liter engine. Fiat also will supply Chrysler new platforms to develop cars in the compact and mid-sized, or C and D, segments — glaring weaknesses in Chrysler's lineup. In the compact, or C, segment, Chrysler offers the Caliber, Jeep Compass and Jeep Patriot. In the mid-sized, or D, segment it has the Chrysler Sebring, Dodge Avenger and Journey. In a report on the proposed alliance, Michael Robinet, CSM Worldwide vice president of global forecasting, said Chrysler is uncompetitive in the compact and mid-sized segments. "Fiat offers Chrysler the ability to field small/compact unibody offerings with stronger global scale and increased fuel efficiency," Robinet wrote. Said Griffiths of Global Insight: "The potential opens up immediately with joining that with something like the Sebring platform, that size vehicle." The C-Evo debuts at the end of this year in Europe on the Alfa Romeo project 940 car, which replaces the current 147. The C-Evo is a sporty hatchback stylistically inspired by the 8C Competitizione, a high-priced supercar sold through some Maserati dealerships in the United States. Fiat hasn't decided which models it will build on the stretched C-Evo platform. A Chrysler mid-sized car could be the first application. In 2007, Chrysler formed a team, called Project D, to explore possibilities for replacing the Sebring and Avenger. The team was disbanded in September, and CEO Bob Nardelli said Chrysler had moved the project down its list of priorities in the face of the credit crisis and the request for federal funds. Fiat may distribute the Journey cross-over and the Dodge Dakota pickup in Latin America and other markets, say sources familiar with the plan. Fiat's benefits may be more on the manufacturing and distribution sides of the deal. Fiat would gain cheap access to the North American market, where it hasn't played since 1995, when Alfa Romeo withdrew. Fiat also could fill a gap in its engine lineup with a V-6 from Chrysler's Phoenix family of engines due next year.